The Performance 7MM Knee Sleeves by Stoic is used by countless powerlifting enthusiast, both professional and people who just enjoying body building. The Performance 7mm provides the benefits you’re looking for when it comes to weight lifting. Because of the attention provided by the manufacturer, you can be sure that this is one pair of robust sleeves which will give you as much warmth and compression as possible every time you put them on. Slip them on yourself and feel the immediate difference with the following great features. They are made of ultra high density 7mm neoprene, for superior support and rebound, especially when performing heavy workouts. The inside and out of the sleeves were made with heaviest grade tear resistant materials. They are built to outlast other knee sleeves in the market as they are made of the highest grade and heaviest duty materials. Stoic’s patent pending triple reinforced seam is considered to be the strongest stitch used on any knee sleeve. They are designed to provide warmth and compression on the knee joints and other surrounding muscles. They were tested to perform well even in the most extreme conditions and provide superior levels of support. They can significantly reduce aches and pains during exercise because of the added heat retention. They come in full 30cm length so they can provide complete coverage and support. The extra length provides a more secure and supportive fit than other standard knee sleeves available in the market. They are recommended for anyone who needs knee support and they can be used by all levels of fitness enthusiasts, from gym goers to professional athletes who compete. They feel great especially when worn during squats. The quality is very good considering its price range. The material is thick and bulky so it is not a good idea to wear them under workout clothes. They easily absorb sweat and moisture. They are a little stiff, so they can be uncomfortable when used during other activities aside from exercises. Stoic, the company who manufacture these performance knee sleeves, spent several years of research to develop sleeves that people, especially athletes, will not consider awful. With many years in the making, athletes who use the sleeves can be assured that special attention was given to every detail and that there are no weak links in their construction. The minute you slip these sleeves over your knees you will immediately feel the quality difference. 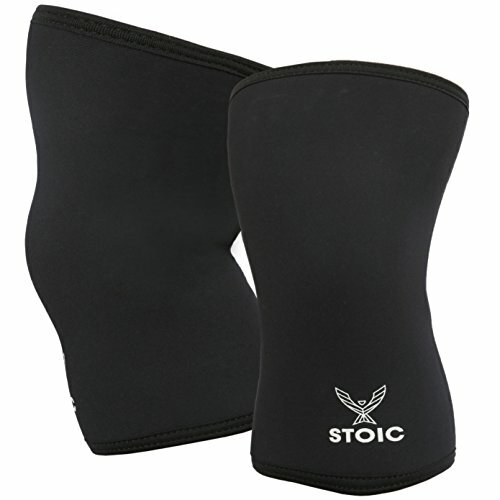 Needless to say, these Performance 7MM Knee Sleeves by Stoic are made of professional quality. They are heavy duty and are built to last with tear-resistant and high grade materials. They were designed for athletes who do a lot of powerlifting, bodybuilding, and weightlifting. These sleeves can definitely help you get to the next level in both training and completions. Stoic is known and valued to provide maximum support and performance, which is why so many athletes and fitness enthusiasts prefer them. Almost any athletic or physical exercise involves your knees, and usually puts a lot of extra stress on them. That’s why it’s important to protect your knees from injury with knee sleeves. When it comes to weight lifting, bodybuilding, or powerlifting choosing the best knee sleeves is especially important for protection. Because the knee sleeve you use will be responsible for providing the support and protection your knees deserve, I can’t stress the importance of choosing the right sleeve too much. Sure, it seems difficult to choose the best one from so many alternatives, but here are some factors to consider. And each could make an impact on your own powerlifting performance. I think the most important feature of knee sleeves is how they fit: choosing the right size. The right size will feel feel comfortable on your knees even when doing heaving lifting, the wrong size will have several negative effects. If the size is too small, they will bind, cut off blood supply, be uncomfortable, and provide less overall protection. On the other hand if the sleeve is too large, you won’t get enough compression, be uncomfortable, and slide up and mostly down your knees. Of course quality is a large factor! Because I don’t want to buy knee sleeves every month, I would much rather go ahead and invest in a pair of high quality sleeves for lifting up front. Choosing something made with high quality fabric and other heavy duty material assures you of the best value for your money. All knee sleeves aren’t designed for the same job, so make sure that you choose knee sleeves that are designed for heavy lifting. At the same time, they should also feel lightweight and comfortable so that you will not feel any uneasiness while wearing them. These are just some of the important factors to think through when you’re looking for the best knee sleeves. And there are millions of athletes and exercise enthusiast all over the world that count on Performance 7MM Knee Sleeves by Stoic to get the job done.